Dentists have filled and restored teeth with materials made of mercury and silver for over 100 years. While effective enough, these metal fillings simply did their job without any regard for visual appeal. Fast forward 100 years and now people are recognizing that fixing a tooth doesn't mean having to live with a mouthful of unattractive metal. Composite resins have been developed to provide patients with the option of filling cavities or fixing teeth with a natural-looking white material, tinted to blend in with your teeth, rather than the grayish metal of the past. Natural looking composite materials are so attractive that patients are requesting not only that their existing metal be replaced with the new resins, but that it be used for a number of cosmetic improvements including changing color of teeth and reshaping disfigured teeth. Call us today to find out how you can bring a fresh, young look back into your smile. 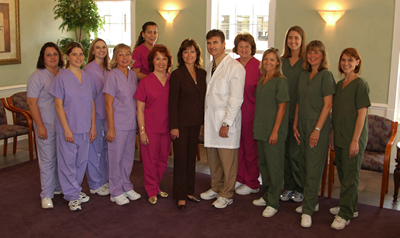 Richard D. Sanderford DDS. PA.